If audio is one of your preferred storytelling formats, chances are that by now, you would have given podcasts a try and are already familiar with the classics: Serial, This American Life, Freakonomics, to name just a few. But how many podcasts in your local community, whether that's your neighbourhood or the city you live in, are on your radar? New podcast distribution platform Satchel wants to help you discover more. 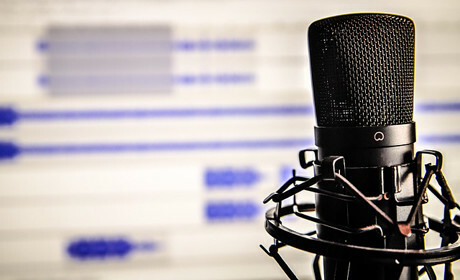 "I have been a fan of podcasting for over 10 years," Beau York, chief executive of Satchel and creator of Podastery Studios, told Journalism.co.uk. "Mainly, I wanted to really understand this industry and why podcasts weren't taking off as a primary medium for audio and specifically, talk radio." York, who was awarded $35,000 (£25,156) from the Knight Foundation Prototype Fund last week to develop Satchel, spent the last three years experimenting with producing different podcasts. He found out that in order to be successful, the format needs to be backed by three key elements: distribution, discoverability and revenue. Through Satchel, he hopes to create a platform that "really benefits both the listener and the podcaster at every single level". The project has been available as an Android app for about three months, with the iOS version currently being developed in beta. The main feature York will be expanding with the new funding is the discoverability function in Satchel, that will allow users to search for podcasts in their area using the GPS and locations services on their mobile device. "The way things are done now, you can create a podcast focused on your local community, but if it's distributed through existing international channels, it can be hard for you to find that local audience," he explained. Satchel's aim is two-fold: it helps producers get their content in front of the relevant audience, and it lets listeners find shows they are genuinely interested in because they are relevant to their local area. The app will also have a feature called Clipshare, through which people will be able to distribute up to 45 seconds of audio on Facebook or Twitter as they are listening to a podcast. Clipshare will embed an audio player in their social media post, together with a link to the full episode and a button for subscribing, something York referred to as "the initiated into the world of podcasting helping the uninitiated discover it through curated moments of their favourite episodes". "I think we're in a bit of a moment right now where people are actually enjoying knowing where their content is created. "They want to get more plugged into what is happening in their neighbourhoods and the immediate world around them, so local podcasting really allows for that kind of community to grow and connect people to one another." York explained the focus on local came from the current limitations of terrestrial radio – many programmes are created and broadcast according to the physical range they can reach, so people are "creating local content because the airwaves only allow them to reach that local space". This is both a negative and positive aspect, he said, because some people are creating that focused content, but not necessarily investing a great amount of effort into it. York, who is based in Jackson, Mississippi in the United States, has drawn inspiration from the feedback listeners provided to one of his own podcasts, Let's Talk Jackson, which has a segment called 'Conversations from the capital city and beyond'. It features discussions with a variety of people including local artists, activists, entrepreneurs and musicians. The easiest way for a creator to see whether or not they are tackling the right topics or reaching the right people is through Satchel's donation feature, which listeners can use to give money to their favourite podcast, as the app will not feature any advertising. 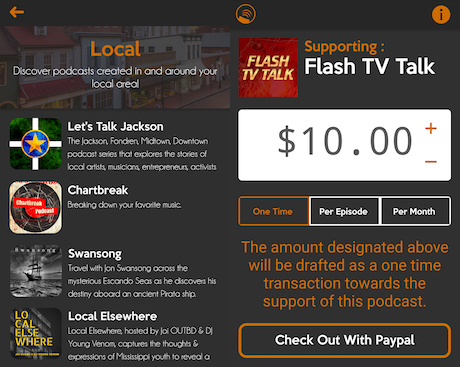 Currently, members of the audience can instantly pay a one-off amount of money through PayPal, but as the app develops more, they will be able to set up regular monthly payments or individual episode donations. "Many podcasters use listener support as their primary method for revenue and some, especially those just getting off the ground, may only have a couple of hundred people listening, due to the refined and niche nature of their content," York explained. "Our goal is to create a completely ad-free experience where there are no on-screen ads or third party ads injected into the audio. That being said, if the podcasters themselves have advertising as part of their podcast, it will remain there because we do not edit their content." This strategy can remove the "road block" of advertising for producers, allowing them to focus on the content and the experience they are creating for new and returning listeners. York would get frustrated when one of his podcasts was reproduced on another player with an audio or on-screen ad attached to it, he said, because it might not represent the actual content and it would not give him any revenue back. Satchel can be used by any content creator for free, although the service does take a "small percentage" from listeners' donations, which varies according to location. In the future, paid search results could also become part of the longer term monetisation strategy for the app. Currently, podcasters can log in to satchelplayer.com on the web to manage their content and monitor how many people are donating money and what their total is for the month, even if the app is not yet fully available on the iOS market. "Ultimately, our goal is to progress podcasting in the industry and see it succeed," York said.